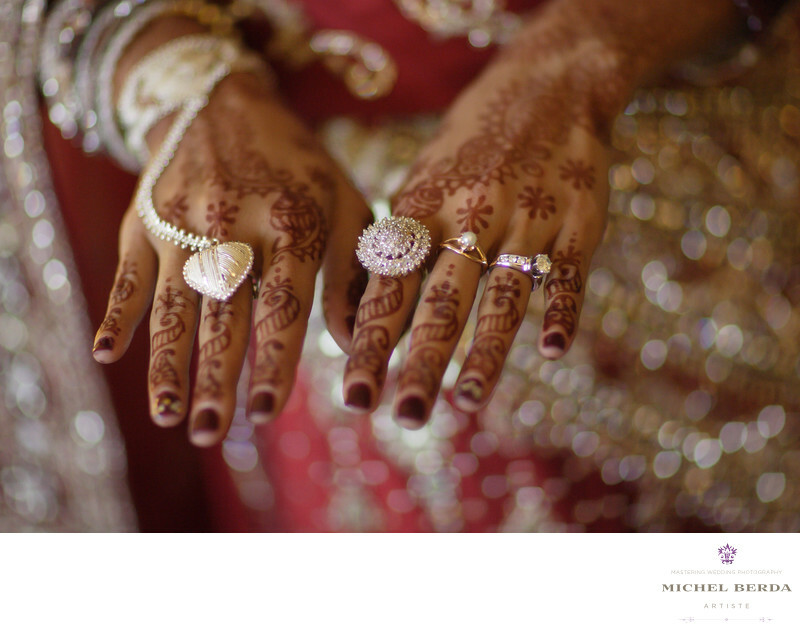 Indian weddings, every photographer dream to capture one. For me as a Charleston Wedding Photographer. I have done many of these, a huge honor, and such a great privilege, the red colors, the amazing details that a bride wears and the weight of it all, the jewel, bracelets, rings, hand painting, foot painting, head piece, all part of this amazing ceremony and culture. As a Charleston Wedding Photographer and by setting and composing this amazing capture, my goal was to photograph each and every detail the bride had. For this image the hand painting and the jewels she wore, who they were from? What was the special meaning behind them that meant so much to her? This images means a lot to her because all of the answers she knows and what the meaning are to her for wearing all of the jewels, that is why I captured this image and my focus of my lens was just on that, the blur in the background of her dress plays a huge factor in this image because your eyes are on the jewelry and hands, exactly what I wanted to accomplish in this images.Keywords: Charleston Wedding Photographer (24).